A Year of FHE: FREE PRINTABLE // Four Easter Word Searches in Black & White or Color! FREE PRINTABLE // Four Easter Word Searches in Black & White or Color! 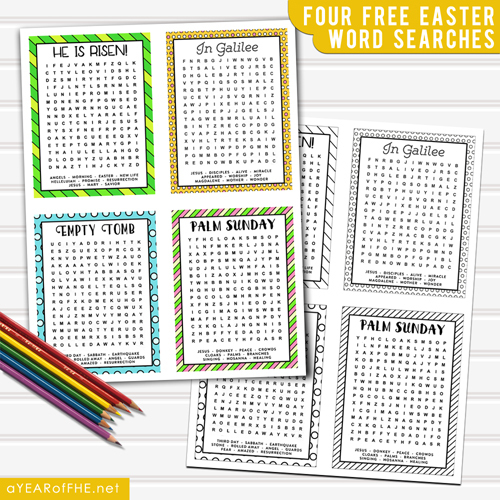 With Easter Sunday coming up I thought I would share some PRINTABLE WORD SEARCHES that can help your kiddos be quiet during church services. You can print these in bright Easter colors or in black and white so kids can color the edges first and then do the word search! You can leave these all on one page or print and then cut the page into four quarters for smaller pages which can be left separate or stapled along one side to make a fun mini book. Enjoy!